Vintage Raleigh has arrived at Ree-Cycle. 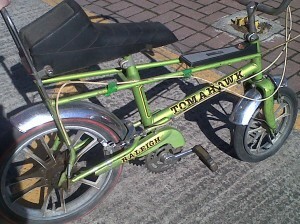 We have taken stock of some classic old school pieces including this lil Raleigh Tomahawk, two Grifters and Strikers and many shoppers! We are in the process of carrying out resto work on them, so keep your eyes peeled for before and after pix.